The city bought the lot from Thomas S. Wallin for $800. Local architect Smith Hoag was tasked with the fire house’s design. The Classical Revival structured was completed in 1903 at a cost of $6,262. The first firehouse captain was William Seyfarth. The station was built in near-isolation in the southeast extremes of Elgin, but the nearby neighborhoods quickly filled in. Wallin also deeded a small lot by the station to be used as a recreational area. In 1905, a fountain and basin were constructed there and stocked with fish. In the 1910s, many of the horse-drawn carriages of the fire department were replaced with automobiles. Telephone lines were installed between stations in 1919. During the Great Depression, Fire Station 5 was closed and the men instead worked Fire Station 1. While closed, the building briefly operated as the studio for sculptor Trygve Rovelstad. Fire Station Five reopened in 1939. The building was listed on the National Register of Historic Places on August 5, 1991, shortly before it was to cease function as an operating station. 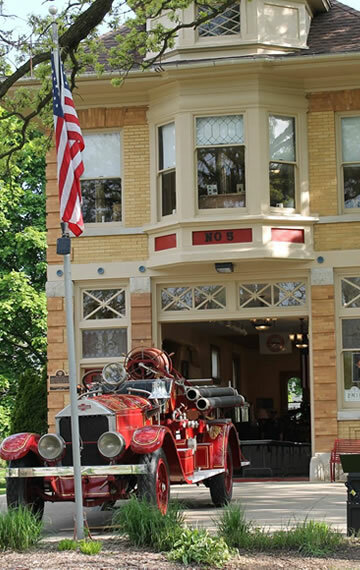 It now operates as a museum and contains historical firefighting artifacts, including a Silsby Steamer engine used to fight the Great Chicago Fire in 1871. Smith Hoag wanted the Fire Barn to reflect the changing public perception of firemen. The front of the building (south) was intended to resemble a commercial storefront with a large apparatus door. The door is not original; it had to be replaced to meet the demands of larger firefight equipment. The Classical Revival style was popular in the 1900s; Hoag incorporated elements of the style by including a second-floor bay window and fancy window shapes. The main door and bay window are both flanked with windows on each side. The building was built with blonde brick with red brick highlights on lintels at quoins. The roof is hipped and features a domed, octagonal, wooden cupola, used as a bell tower. A semi-circular stained glass window adorns the east side with brick pilasters below a brick frieze. Two windows are on east side of the semi-circular window. The south end of the eastern exterior has a chimney and the north end a dormer. The west side is similar to the east but has a two-story bay window and no chimney or dormer. The north end features smaller windows and a hayloft. Inside, the front of the building originally housed the firefighting apparatus while the rear housed the horses. Personnel stayed on the second floor and could access the first floor via a brass sliding pole. A steep staircase, intended to keep horses from following firemen up to their quarters, also led to the second floor. Hay was stored in the third-floor loft. The captain had a room of his own with a desk.